Ace DivX Player is the best Windows Media Player replacement program, Ace DivX Player plays movie and music in formats including DivX, AVI, MPEG, WMV, ASF, MP3, CD, VCD. What Ace DivX Player offers you is what a handy movie and music player really should does: Powerful Playlist, Freely resize movie window and full-screen playback with onscreen controls. Ace DivX Player doesn't contact the Internet each time you load and play a file. It's safe! Windows Media Player replacement program that watch DivX movies and much more. ...... Ace DivX Player use less memory and loads very fast. DivX Subtitle Displayer - Play DivX movie with well displayed subtitle ! Convert video clips to DivX DVD Player compatible movies and burning. 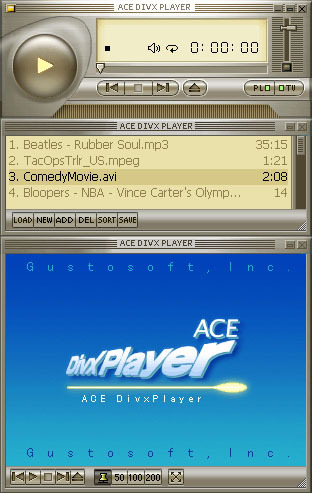 Qweas is providing links to Ace DivX Player 2.1 as a courtesy, and makes no representations regarding Ace DivX Player or any other applications or any information related thereto. Any questions, complaints or claims regarding this application Ace DivX Player 2.1 must be directed to the appropriate software vendor. You may click the publisher link of Ace DivX Player on the top of this page to get more details about the vendor.